Most members of Congress are excited to cut the ribbon for a new stretch of freeway, but it’s a smaller set indeed that will stand up for the removal of a highway, no matter how neighborhood-blighting. As of yesterday, count New York Senator Chuck Schumer among their number. The highway in question is a short stretch of the Robert Moses Parkway in downtown Niagara Falls (the name adds a certain historical sweetness to its removal). The highway, which sits on an elevated berm, would be replaced with a lower and slower two lane “park road” and bicycle and pedestrian facilities. Taking down one mile of highway, said Schumer’s office, would open up 40 acres of the waterfront. CNU lists three New York highways above the Robert Moses Parkway on its list of “Freeways Without Futures” — the Bronx’s Sheridan Expressway, Buffalo’s Skyway and Route 5, and Syracuse’s I-81. Though Schumer forcefully articulated the damage that highways can do to the urban fabric yesterday, don’t expect him to get out in front when it comes to the removal of those three highways. 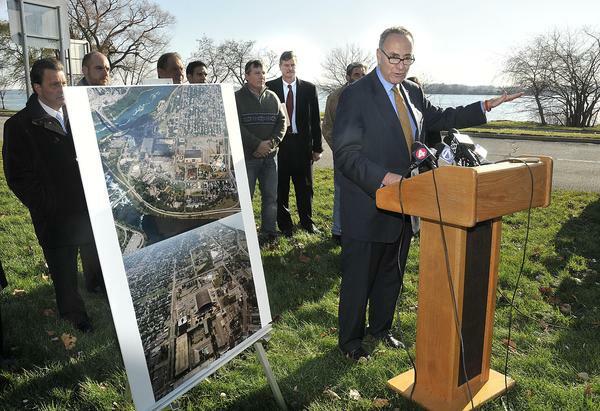 While there is a local push underway to remove a much longer stretch of the Robert Moses connecting Niagara Falls to Lewiston, New York, Schumer said he’s staying out of that fight. “I’ll leave that up to the local folks. When the local folks determine that’s something is good and needed, and the facts bear that out, my job is to bring federal dollars,” Schumer said at a press conference, according to belowthefalls.com. Schumer decided to support the downtown Niagara Falls highway teardown, his office said, due to a solid consensus behind removing the downtown stretch of the Robert Moses and the project’s particularly strong economic development benefit, given Niagara Falls’ 8 million annual tourists. Still, it’s an exclusive club of United States senators willing to support a reduction in automobile capacity at all. Connecticut’s Chris Dodd and Joe Lieberman each voiced support for New Haven’s plans to replace the Route 34 highway stub with a boulevard and development, and Maryland’s Barbara Mikulski — who got her start in politics fighting a freeway — cheered the teardown of Baltimore’s Route 40. Dianne Feinstein supported but didn’t succeed in removing San Francisco’s Embarcadero Freeway while mayor. Of course, Schumer could really set himself apart by pushing for more than one highway teardown. Hey Chuck, great speech… how about you give your speech again but replace the words “Robert Moses Parkway” with “Gowanus Expressway” or maybe even parts of the “the BQE?” just a wonder…..
i recall in my silly youth when attending college at UB, i would frequently take this VERY desolate highway and easily do 100mph without a single car in sight whenever i had a rental car. even back then, nobody used this highway. Good thing Chuck and his wife don’t own an apartment along the Parkway. Otherwise Iris would be on the phone to Randy trying to sue to keep the thing standing. While you’re at it, Chuck, please leave PPW up to “the local folks,” too. You have to give it to Moses. While Stalin and Mao were building statues, he was building highways. Which ideology is still standing? Carma is totally right. That stretch of highway is always empty. It’s pretty odd actually. I do actually enjoy driving down it whenever I drive to/through Niagara, though, because of the emptiness and the nice scenery. However, that’s a pretty expensive experience for all of us taxpayers. Obviously it would be nicer if it was just a minor road integrated into the city with facilities for non-cars. it would be actually a good thing if it really does bring new commerce to the town. the area desperately needs something. However, if its just endless construction that still wont benefit the long term perspectus, then i would be totally against this as this is just more waste. building an at grade road would definitely prevent folks like my past youth from tearing up the highway at 100+mph. I’m fine with Schumer here – he has no local vested interest in the highway existing, so he’s listening to local power brokers who realize that a usable waterfront is more important than an underused freeway. Unlike in New York, in Upstate cities the freeways are empty since they were built based on projections of population growth whereas the region in fact underwent population loss. This makes tearing them down a more obvious proposition than in New York, where those roads are all full, leading to (completely unjustified) fears of traffic jams in case they’re torn down. Also, Stalin built the first four lines of the Moscow Metro, too. Will the Feds Support Rochester’s Downtown Highway Teardown?